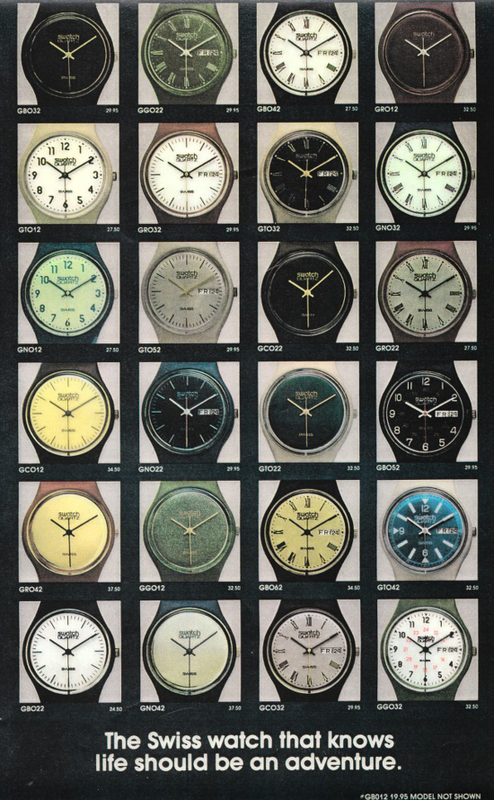 Features: In the late 1970s, the Swiss watch industry was in deep crisis. The country's centuries-old traditional approach seemed doomed to disappear in the face of competition from cheap, mass-produced quartz watches. A radical approach was needed, and the drive to simplify was soon complemented by a search for innovative materials and methods that would allow the production of an entirely new kind of Swiss watch. A small team of visionaries, working in secret, got a solution. 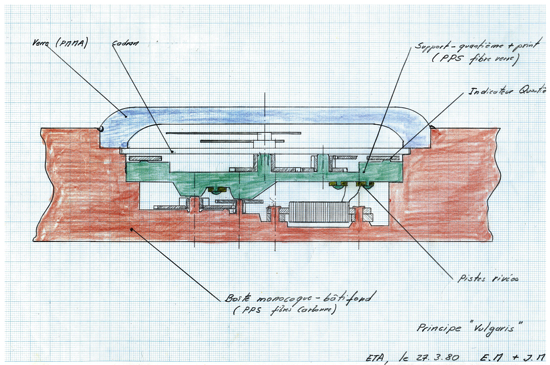 ETA SA engineers Elmar Mock and Jacques Müller, under the direction of the then ETA SA's CEO Dr. Ernst Thomke started with a one-piece case made of plastic, the bottom of which also served as the bottom plate for the movement; they also have managed to decrease the number of assembled parts from about 100 (as done by Japanese competitors) to a mere 51 - operation known as "Revolution 51" -, hence further reducing the manufacturing costs. Working in sinergy with the engineers, designers Marlyse Schmid and Bernard Müller represented the creative heart of the team: they designed the final version of the casing - the shape and the two additional bridges for stabilizing the mount of the strap, which is one of the main characteristics of Swatch watches; they have designed almost all dials from 1981 prototypes up to 1986 market models, integrating in a very intelligent way the fluctuations in style and changes in color preferences through the years. 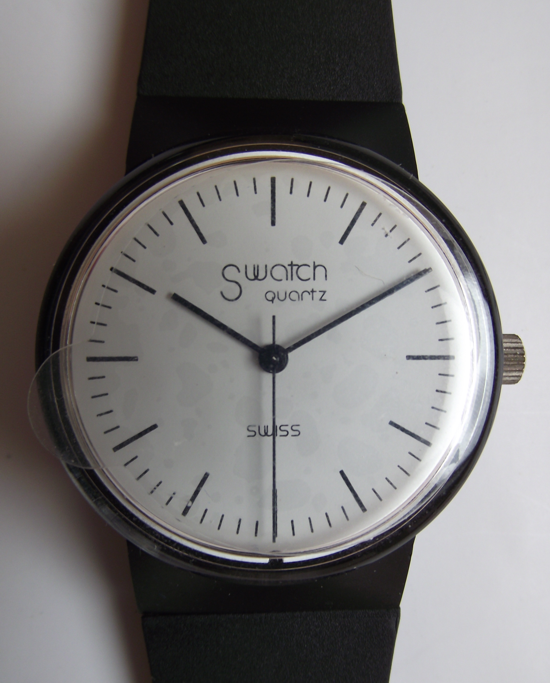 Even the Swatch logo, which is one of the easiest recognizable logos, has been created by them. 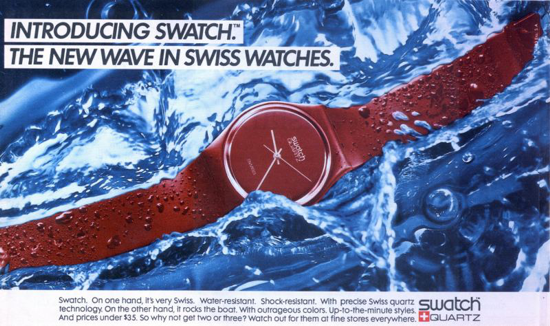 The overall result was a youthful watch which combined the highest Swiss quality with a new, trail-blazing attitude: Swatch. 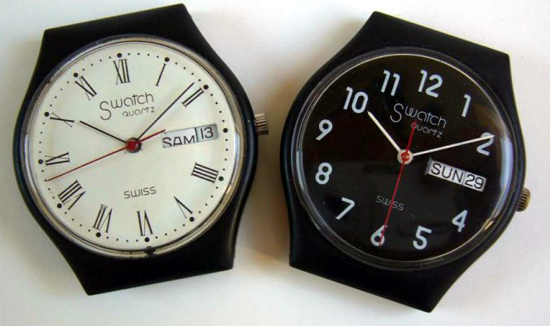 Interesting facts: The name "Swatch", initially conceived by marketing consultant Franz Sprecher as a contraction of "Swiss Watch", was also intended as a contraction of "Second Watch", meaning a low-cost, high-tech, artistic and emotional watch. 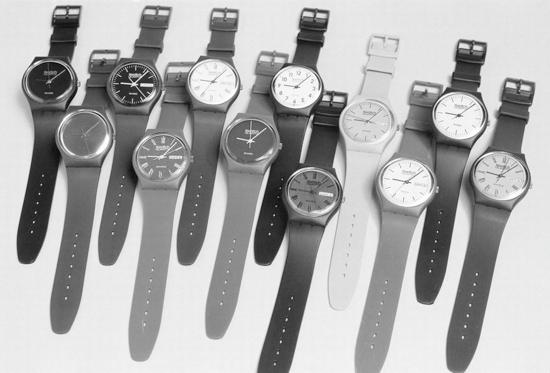 Swatch watches, first model launched to test market in USA (October 1982). 10,000 handmade pieces were product and distributed in Dallas, Texas. 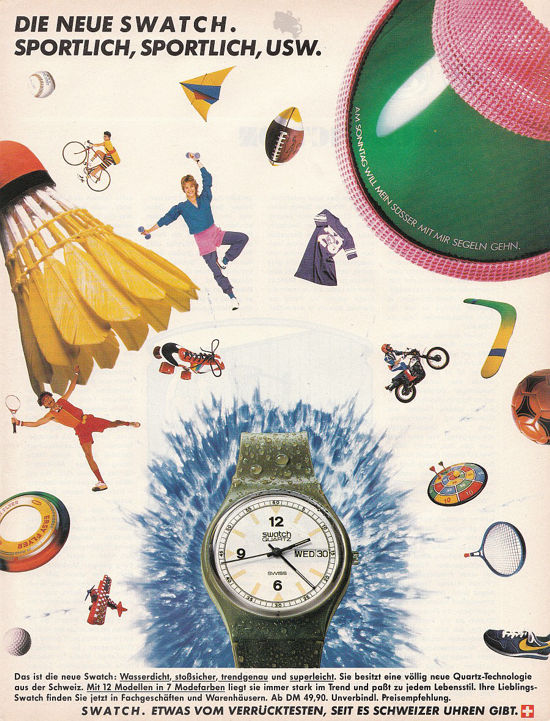 The introduction to the market was a flop; but soon these watches, handled as Fashion accessories, with new collections, fancy colors, crazy dial, and strap designs became a huge bestseller. 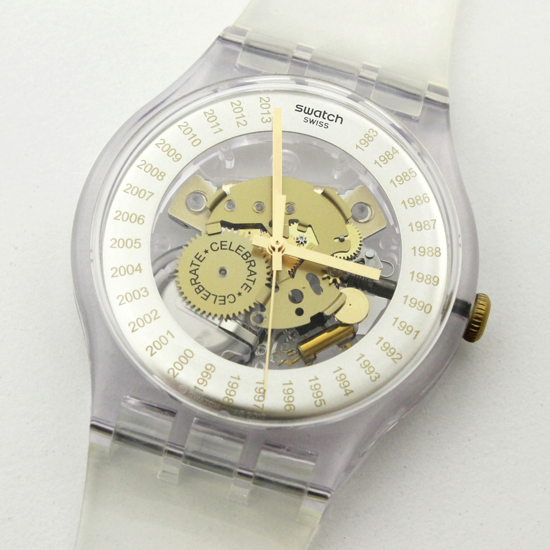 Swatch watches, "The Original Jelly Fish" (ref. 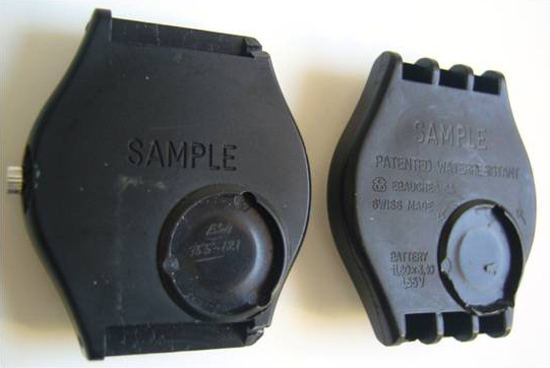 GK100 SP, early 1983). Designed by Marlyse Schmid, the first transparent watch was launched in a limited edition of 200 pieces. 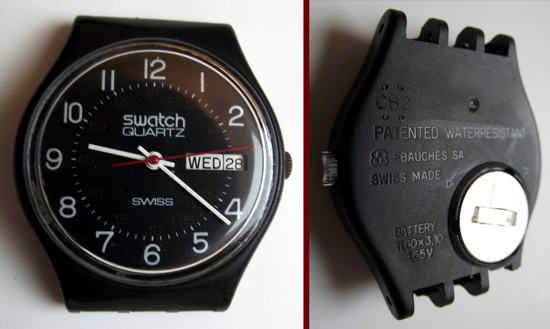 This was the first "Special Model" introduced by Swatch. Elmar Mock (La Chaux-de-Fonds, 1954) and Jacques Müller (Porrentruy, 1947), the engineers who created the Swatch watch under the direction of Ernst Thomke, then CEO of ETA SA Manufacture Horlogère Suisse. 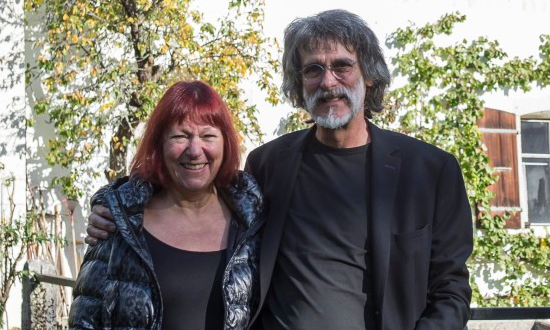 Marlyse Schmid (La Forclaz, 1946) and Bernard Müller (Reconvilier, 1953), the designers who developed the Swatch iconic design. If Elmar Mock and Jacques Müller represent the inventors of Swatch, Marlyse Schmid and Bernhard Müller gave it an identity. 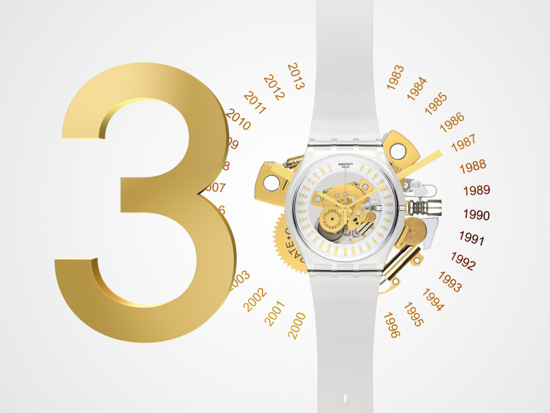 Swatch celebrates its 30th anniversary (1983-2013) with a special release: "Est. 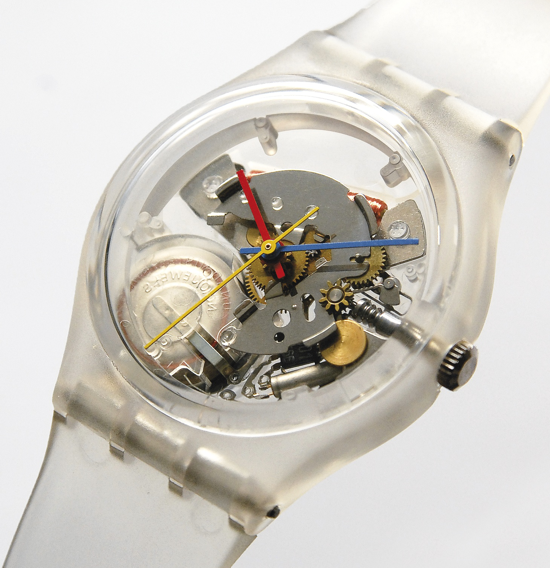 1983" model, which features a skeletonized see-thru case with gold years instead of hours. Swatch 30 years celebration at the annual watch fair in Basel, Switzerland, April 2013. The spacious Baselworld booth became Planet Swatch, which evolved each day to reveal the rich diversity of the brand.